For the last five years I have crossed the threshold into January not with a New Year’s Resolution, but with a word to carry into the coming year. This word may be encouraging, perhaps something I need more of; it may be motivating, or something to become or aspire to. In past years I have had GRACE, JOY, and last year it was FEARLESS. And with that word, I entered back into working outside the house, I began to attempt inversions in yoga once again, and started to take travel writing more seriously by putting myself out there more and actually referring to myself as a writer when asked. FEARLESSLY. In November I was given the word SHINE. I even went as far as putting Shine on our Christmas card. I was ready to shine, let my light so shine, shine bright for all the world to know. Shine. But as the year turned over, my pretty, bright, happy word no longer sat well with me. I needed more gravitas. I need some weight to my word. This is a MAJOR year. I am turning 40 for one, which doesn’t bother me, but come on, a new decade is a pretty big thing. My husband is retiring from the military, so as I sit typing, I have no idea where we will be in six months. As a military wife, I have always warned my friends “Don’t get to close, I may leave.” But now after being stationed in the same place for TEN years (hallelujah! ), I may actually leave. THIS IS BIG. So I sat down with my dictionary (because I LOVE dictionaries…and thesauruses, as well), and began to look up heavier words. I played with REMEMBER and WAIT. My go to was GRATEFUL because I do believe gratitude can turn a situation. But it wasn’t there yet. I presented TRUST to “my girls” and they earnestly and unanimously agreed. But I wasn’t convinced. Trust seems to take away any control I might have naively convinced myself that I have. It feels very scary of a word. In therapy, you have to “trust the process,” that even though you may not see it working at the moment, let it do its work. I say I “trust” where God will lead us. The song “Oceans” has resonated with so many people of my generation with the lyrics “Spirit lead me where my trust is without borders.” Oh, but it’s so hard. But it wasn’t until my husband, as he was crafting his resume and I was offering my editing skills, said “You have go to trust me.” Ding, ding. This next step is out of my hands. I have to trust that God, husband, military, schools, life, is all going to work the way it’s supposed to work. So I found my word for 2015. 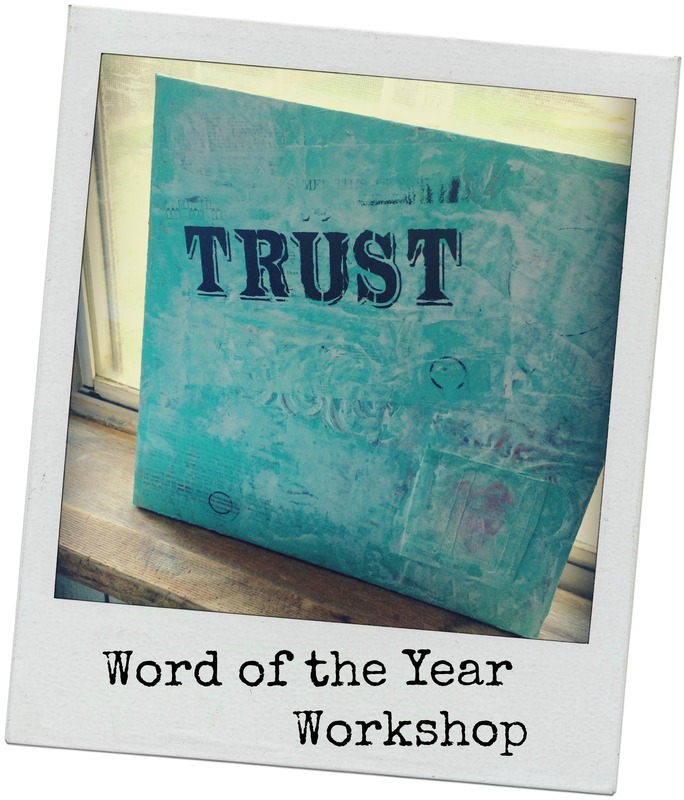 Within the week of my word revelation, my girlfriend Alison at Beauty in All Things, invited me to a Word of the Year Workshop where an artist led us through a project using our word, and a life coach filled in all the hidden meanings and details. Lynn, the artist at A Little Blue Sky, with her effervescent smile and creative charm, designed a night with life coach Sue Robson, to take us step by step through the layers of our word and what it might mean in the new year. We began writing conclusive words about 2014 on a piece of plywood. They could be negative, ending, beginning, factual, it didn’t matter, they would be covered up and they would be done. The next step was to lay textured paper down and cover our board (and written words). Step three had us lay down the paper or momentos we might want to see through our paint. There were song sheet music, dictionary pages, and vintage children’s books among other things, to rip up and collage onto our board. We then took paint and painted over the entire board. Taking a credit card, we scraped and rubbed and found little bits that we wanted to jump out from under the paint. I let the definition to “whirlwind” show its way through as Im sure this will be a whirlwind of a year. Very lightly you can see the title to “Jesus Loves Me This I Know.” Trust takes a child like faith and that children’s song strips it down to the basics of what it’s all about. Lastly a poem with the line “She destines to be creative” makes its way through the paint layer. 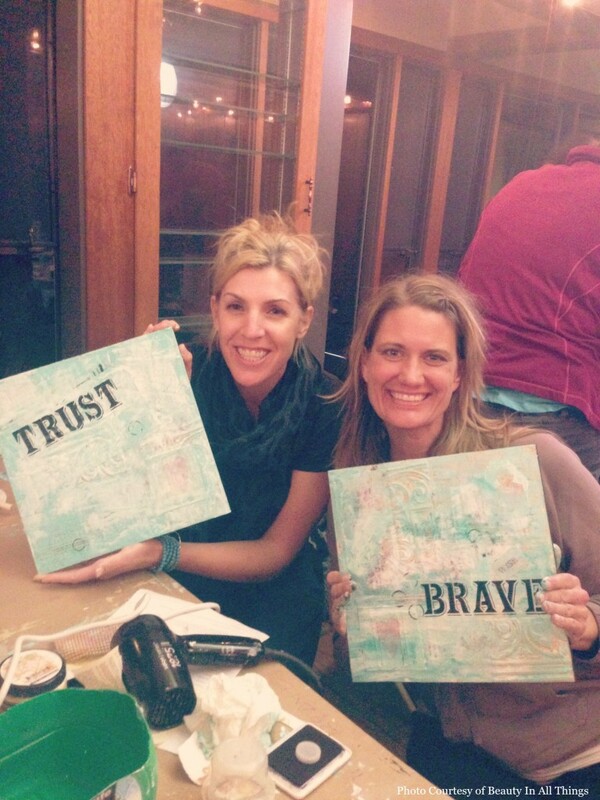 At the end, we stenciled our word of the year across the board. Boldly. With Confidence. And that’s how I hope to step into this year. With trust, bold and confident trust. So beautifully written. What a way to start the year. Stepping into the unknown in n bold confident trust. I’m inspired! This is happening in our home. Thank you for sharing. Thanks C! I have since updated my word of the year. What I needed at the beginning of the year changed. I decided since there are no rules to all of this, I’d make up my own.